First of all... I beg for your forgiveness, please do not judge me, or Weeman, for this thread. Basically, this thread is what the title says it is, hopefully me and Weeman can provide you with some entertaining thoughts on some entertaining films. I managed to get this film in 100th place on the nineties list thanks to the 23 points I gave it, I know Weeman loves it and we also have Miss Vicky joining us in tonight's commentary. Last edited by Daniel M; 08-24-13 at 08:58 PM. Currently waiting at the main menu. BTW, the site requires you to wait at least 20 seconds between posts, so you might find your thoughts getting constipated or it might seem like people are a little behind in the movie when they're not really. It can be a little frustrating. 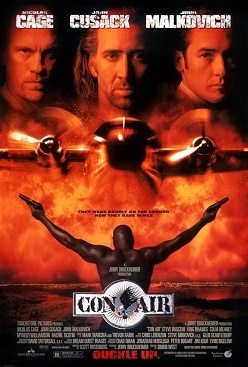 I don't have Con Air. Or else I'd join. Welcome to this delightful thread which will be filled with insightful, and meaningful observations about film. Or maybe not. As Daniel says, tonight we deal with Con Air. So, the post race begins. I love how 'important' they try to make Cameron Poe seem. What a hero. Also can I just say right now how much I LOVE John Malkovich, Steve Buscemi and John Cusack. I'd take a beating half my life to get a piece of that woman. 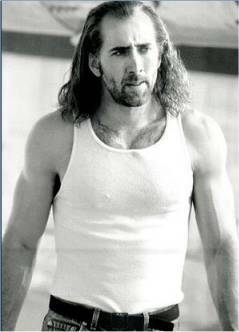 Cameron Poe has a fantastic "Southern" accent. And he's a lovely bloke. And he's Nicolas Cage. Yeh, I almost forgot that this whole opening scene actually exists. The love story between Poe, his wife and his daughter I have always seemed as pretty unimportant, it's the driving force behind Cage's character's motivations, but lets me honest, who actually cares for it? It's just a platform for the real entertainment that takes place, but if a pink bunny for your daughter isn't a good excuse for an awesome action film, I don't know what is. She looks too young to be involved with Nicolas Cage. Good god I hate this theme song. And now they get in the car, seemingly miles away from the bar?